Today is the day. A monumental day in the world of horror films. Finally, at long last, "Hatchet" is being released on DVD. Oh yes, it will be mine. I've been excited to see this film ever since I heard Kane Hodder's name was attached to it following the FvJ burn he received. For those of you not in the know, Kane Hodder played Jason Voorhees from Friday the 13th VII onwards (and did some stunt doubling prior to that). He was the first actor to breathe real life into the character. 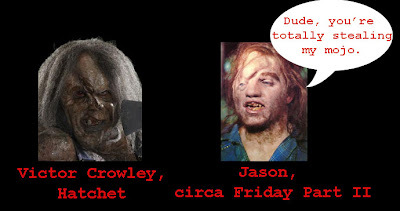 Jason as played by Hodder is not some doddering, backwoods hillbilly. He is hulking, seething, rage incarnate. In many fans eyes, Kane Hodder defines Jason Voorhees. When Freddy vs. Jason was announced several years back, fans rejoiced. Only to have sand thrown in their eyes when the announcement came that Kane Hodder would not be playing Jason. "What?!" we cried out in unison, but to no avail. The statement that I heard was that the Hollywood big wigs were looking for Jason to be the sympathetic character in this installment and Kane didn't have expressive enough eyes. A mute, maggot-ridden walking, hacking, killing corpse was going to be the sympathetic character. But I digress, as this is all water under the bridge by now. The original point I was trying to make is that this was the first real genre film with Kane's name attached to it in the post-FvJ screwjob world (For the record, I thoroughly enjoyed FvJ. I still missed Kane though.). Even better, Kane was going to be playing the part of the villain, a deformed backwoods man-child by the name of Victor Crowley. A villain that by all accounts sounds as close to Jason Voorhees as one can get without infringing copyright. And, let's face it, there's definitely some similarities in the prosthetics. Some people might balk at the idea of Kane playing a Jason-imposter. Not me though, I relish it. The Jason role was taken away from Kane before his time with it was rightfully over. Myself, and countless other fans, want nothing more than to see Kane back in the hockey mask, shredding horny teens with his machete. Lacking that possibility, I'll accept him doing it with a Hatchet. I should probably mention that as excited as I am for Hatchet, I haven't actually seen it yet. It could be rubbish. Somehow, I doubt it. I've nothing but good things about this one. Also, despite the way I might sound just above this, I'm not hoping for Hatchet to be an exact replica of the Friday the 13th series. As much as I adore the classic characters (Freddy, Jason, Micahel, Chucky, etc. ), the genre has been stagnant for some time. We need new blood (so clever). Hatchet sounds to me like it could be the next big franchise. Only time will tell.